I was very naughty yesterday and put my MIL’s socks on hold so I could start this top for Eva. My reasoning? The socks aren’t due until Christmas, but Eva’s top can be used right away. I probably shouldn’t have cast the socks aside, but at this point, what’s done is done. I love the look of the ruffled sleeves on this top. I’m determined to dress Eva in tons of ruffles until she’s old enough to fight me on it. Right now she seems pretty thrilled with frills, so I’m hoping she’ll love her new shirt. 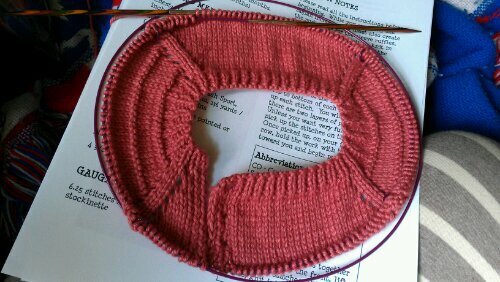 I’m still working on the raglan part, as you can see. I have 5 more rows to go until it will be joined and knit in the round. As for the yarn and needles, I’m using Knit Picks Comfy Sport in “Peony” and size 4 needles. The Comfy Sport seems heavier than sportweight, but that’s not a big deal. I’d rather the top turn out too big than too small. Eva can always grown into it! Categories: Knit | Tags: acrylic, baby, cotton, handmade, knit, pink, pullover, raglan, ruffles, toddler, top | Permalink. Love the color! You made awesome progress in just a day!